Thanks to a fellow team member for this hilarious video clip of ad-lib outtakes from the movie Bridesmaids. And yes, I understand why you play singles now…. Awww… the winding down of the week…. TGIFF! A clip with two of my favorite players Alexandr Dogopolov (with Aussie Pat Rafter) and Mansour Bahrami (with Stanislaw Wawrinka) from the World Tennis Challenge 2012. If you haven’t checked out some videos of Mansour already, you’ll want to after this. This three night exhibition tournament is held the week before the Australian Open in Adelaide, South Australia. The tournament was created by a consortium of past players and format is four teams of two players; a ‘legend’ and a current player paired into geographical ‘areas,’ representing either their country or a continent. The current players play each other in a best of 3 match with a match tiebreaker for a 3rd set. The legends play a pro set, and the doubles play a normal set with no add rules before a super tie break if needed. As you can see, the players have a lot of fun with this. Mansour Bahrami is a talented and entertaining player from Tehran, Iran who never made it big in the ATP tour, but enjoys the Champions Tour still. 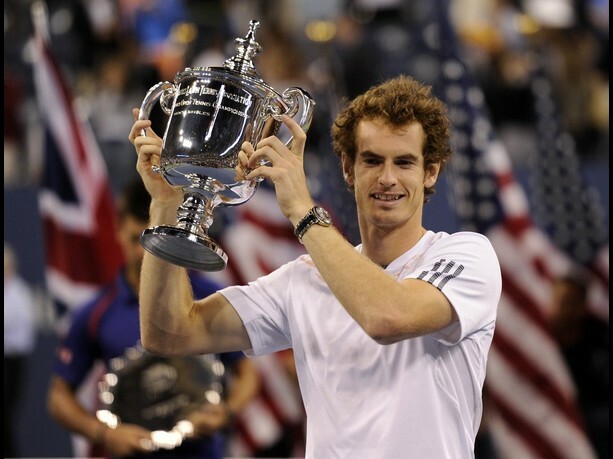 Congratulations to Andy Murray for his first ever Grand Slam Title. An exciting ending to this year’s weather-prone US Open for everyone, except Novak Djokovic of course, and the title lost in the gusty men’s final. With 65 unforced errors to Murray’s 56, they combined for 49 more unforced errors than winners. Howard Fendrich or Fox News has it right; “There probably should have a statistic to count wind-forced errors.” Hey IBM! There’s a new statistic for you to run! I will leave the rest of the statistics to the countless blogs and news sites that have this match well covered, and leave it with this: Meal do Naidheachd! You’ve given us all a second wind! The US Open is not the only competition hosted by New York this month. Last Sunday, the US National Buffalo Wing Eating Championship was held in (yep…) Buffalo, NY. According to the International Federation of Competitive Eating: “Joey “Jaws” Chestnut’s incredible 2012 continued with a world-record setting victory in the US National Buffalo Wing Eating Championship. Chestnut defeated Sonya “The Black Widow” Thomas—his toughest rival … by more than a pound of chicken wings in a display of poise and power. His final total of 7.61 pounds of wings in 12 minutes bested his 2007 effort of 7.5 wings. 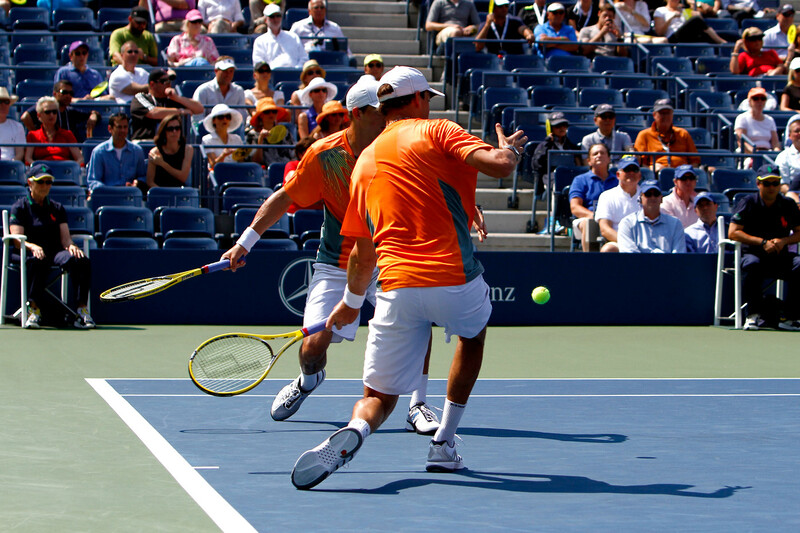 That kind of fierce competition was on my mind as Mike and Bob Bryan won their 12th slam with the US Open Men’s Doubles Finals today. I keep wondering how they would fare against each other in that Buffalo Wing Eating Contest though? I was asked recently to explain what the scores meant in tennis. Huh? The only answer I knew for sure was that the “Love” term may have come from the term “L’oeuf” (meaning ‘egg’ in french) which resembles the calligraphic “0,” and is the name of a fabulous tennis apparel line “L’oeuf Poche” carried on Swing Set Tennis! Love isn’t the only strange thing about tennis scoring. The first point won is called 15, the second point is 30, the third point is 40 and the fourth point is “game.” C’est étrange, non? First, I should explain (in case you don’t play) that a player has to score four points and win by at least two points, and if each player wins four points in the game, the score is 40-40, which is called “deuce.” At deuce, the point system takes another interesting turn to the advantage system. The next player to score a point is said to have “advantage.” If that player then scores the next point, the game is won. If the other player scores, it goes back to deuce. This cycle will repeat until someone wins two points in a row to win the game. As for that ‘système de notation étrange;’ some believe that this unique tennis scoring terminology came from medieval France, where clocks may have been used to keep score. 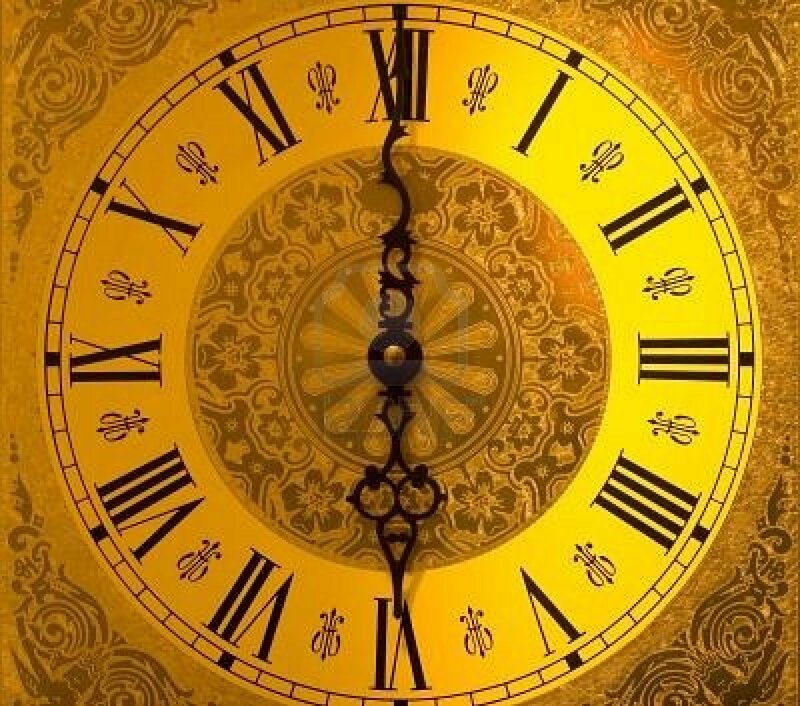 Since four points are needed to win a game, a clock hand could be turned a quarter move, to 15, 30, 45 and 60 (back to 0), to keep track of the score. To allow for the special circumstances of deuce and advantage, the speculation is that 45 was changed to 40, so that advantage could be marked by 50. If a game was won on the next point, the clock would be turned to 60 (back to 0) to signal the end of a game. If not, it could be turned back to 40 to signal a return to deuce. Et là vous l’avez, tennis scoring explained!